From 1967 to 1992, two Anchorage newspapers fought a bitter war while covering the most eventful quarter century of Alaska history. As we wait to learn the fate of the Alaska Dispatch News from the bankruptcy court, that story remains relevant. Newspapers are businesses. They have to make money. But the market makes good decisions. You can succeed with quality, innovation and independence. There's no question Anchorage is large enough for a daily newspaper, or its equivalent in magnitude as an online news source. As to what that looks like, or what mistakes crippled the current business, I'm too close to feel comfortable commenting. But I could write about that if I wanted to. And that freedom is key to whatever comes next. Journalists must have freedom from their employers, advertisers and readers to find the truth, report it without interference, and, in the case of an opinion columnist like me, to express honestly held opinions. Journalistic independence is the only path to excellence and, besides, it is a proven path to business success, when combined with good management and sales. I began reading the Anchorage Daily News when I learned to read. Even as a child in the early 1970s I could see that the skinny Daily News was a better read and a more honest paper than the dominant Anchorage Times. The Times came out in the afternoon. Bob Atwood had owned it since 1935, when his father-in-law, owner of the biggest bank in town, essentially gave it to him as an incentive to move back here with the banker's daughter, Evangeline Atwood (formerly Rasmuson). Atwood thought himself too big for Anchorage and crusaded to build up the town. His largest crusade, and legitimate place in history, was Alaska statehood. The Anchorage News started in 1946 in part to counter Atwood's progressive push. Its secret owner, industrialist Cap Lathrop, thought the Times was too liberal. But the roles reversed after statehood, in 1959. Once a feisty fighter for an underdog cause, the Times became a bully and an inexcusably biased voice. It lost touch with a new generation's concerns. Older friends have told me Atwood was a brilliant and charming younger man, but when I met him, later in life, he came across as an old curmudgeon. In his autobiography he described being disgruntled that his reporters in the 1970s were living together out of wedlock. Larry and Kay Fanning represented that new generation when they arrived in 1967. They bought the Daily News and published award-winning journalism that asked the important questions Atwood's establishment voice suppressed. Kay was the ex-wife of a man with a huge fortune. Her children would receive enormous trust funds. Larry was an experienced editor from big newspapers. With Kay's money — and her children's — they helped modernize Alaska, offering skepticism and objectivity as the state made its biggest decisions. The Times opposed large Alaska Native land claims. The Daily News covered Native grievances. The Daily News pointed out fatal flaws in the design of the trans-Alaska pipeline and, during construction, documented corruption and mob infiltration in the massively overcost project, winning a Pulitzer Prize. But the Fannings never made money. The Daily News continued as a cause after Larry died in 1971, but Kay struggled to keep it alive. The Times nearly crushed the Daily News. A community group formed to help the smaller paper sell subscriptions and get more advertising, called the Committee for Two Newspapers, and the paper received donations from around the U.S.
Kay was near financial collapse when she sought an outside buyer. Fortunately, C.K. McClatchy, leader of a family chain of California newspapers, saw an opportunity. In 1979, with the pipeline complete, Alaska was on the threshold of its biggest explosion of economic growth. The Times was a boring afternoon newspaper — a dinosaur — with a right-leaning perspective that constantly bled into the news pages. Good reporters didn't tend to stay long in that atmosphere. The McClatchy chain invested rapidly and intelligently. It spent heavily on promotion, but, more importantly, the product became much better (it won another Pulitzer in 1989 for a series on suicide and despair in rural Alaska). Circulation shot upward. The Daily News began winning. I worked there for four years. It was really fun. Covering the Exxon Valdez oil spill in 1989, the newspaper bought a boat I could drive around Prince William Sound. Times reporters went to Valdez without expense reimbursement and had to borrow spots on floors to sleep. Bill Allen, owner of Veco Corp. (later jailed for felony political corruption), made a fortune cleaning up the spill and used some of the money to buy the Times from Atwood. His real objective wasn't journalism but pro-business, conservative influence. That formula didn't work. Conservatism isn't a business plan. Some individual journalists did good work at the Times, but Allen's agenda undercut the paper's credibility. Readers chose the more professional Daily News. The Times failed in 1992. 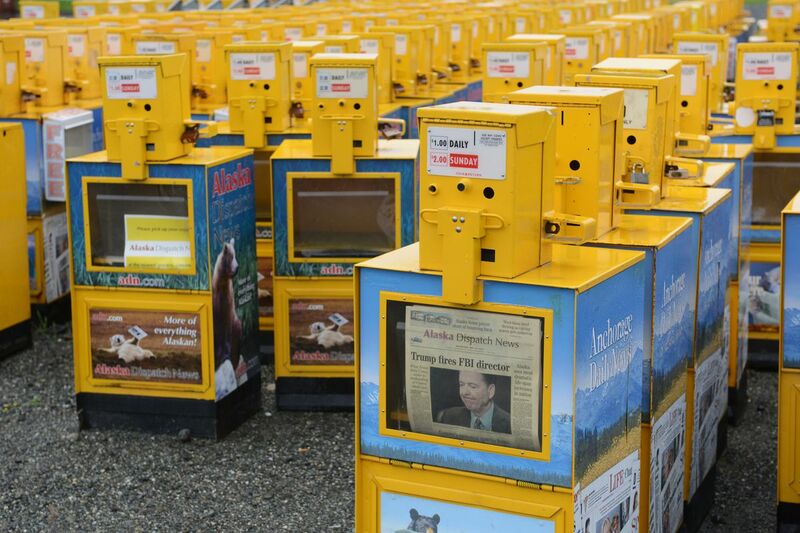 After Anchorage became a one-newspaper town, and with the challenges created by the internet, McClatchy continually cut costs and the newspaper shrank. But I'm told it kept making money. Under publisher Alice Rogoff and the Alaska Dispatch News name, that hasn't been true. Increases in staff outstripped revenues. Like Kay Fanning, Rogoff subsidized the operation from a personal fortune, until that well dried up. Rogoff ran a journalistically solid newspaper. A strong staff wrote aggressive stories. She didn't interfere. The powers that be didn't always like it, but oversight doesn't feel good sometimes. Alaska is changing, as is the news business, but the lessons of almost a century of journalism are still valid. A newspaper is a business and needs to make money to remain sustainable. But a newspaper is not for business. A newspaper is a trust for the community. It alone questions everything. A newspaper has an owner, but it should not be owned. I am lucky enough to get paid to express my opinions here. I take the responsibility seriously. I study my topics and strive to be honest and fair. And no one tells me what to say. I can't control much else, but that won't change.